This leaflet has been produced to give you information about your spinal brace. Most of your questions should be answered by this leaflet. It is not meant to replace discussion between you and your physiotherapist or surgeon, but may act as a starting point for discussion. Your consultant should have explained the reason for having to wear your spinal brace. This leaflet will concentrate on providing you with the information on the physiotherapy input you can expect and instructions for your spinal brace. If after reading this leaflet, you require further explanation please discuss this with a member of the physiotherapy team caring for you. What is a spinal brace and why do I need it? A spinal brace is a device designed to limit movement of the spine. It is most commonly used to manage spinal fractures but can also be used for other reasons such as supporting your spine after surgery. Limiting the movement of the spine through wearing a spinal brace helps the healing process. It may also help to prevent further injury or damage and can help to minimize discomfort. Can there be complications with wearing a spinal brace? Movement cannot be completely stopped within your spine and so occasionally a spinal brace may not be sufficient to manage your condition and you may require other treatments. Wearing a spinal brace will cause some weakness of the muscles around your spine, as the spinal brace will essentially be doing some of the work of these muscles. However, when you no longer require your spinal brace you will be advised to gradually stop using it and you will be provided with an exercise program to strengthen your muscles again. Use of the spinal brace could cause pressure leading to redness or, in extremely rare circumstances, breaking of the skin. Experienced physiotherapists will measure and fit you into the spinal brace to ensure it is not ill fitting. Furthermore you will be instructed to remove your spinal brace daily when you lay down to sleep. The physiotherapist will measure you and determine which spinal brace is most suitable for your size and shape. Initially your physiotherapist will fit your spinal brace while you are lying down. 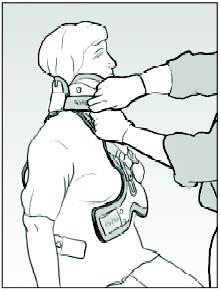 They will then give you instruction on the way in which the spinal brace should be applied and removed. 1. Roll onto your side. 2. Feed the fabric side strap under your body at waist level. 3. 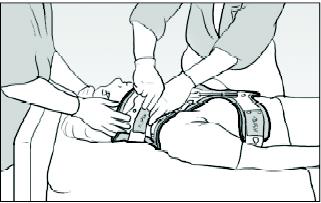 Roll back onto the brace ensuring the brace is centrally located. 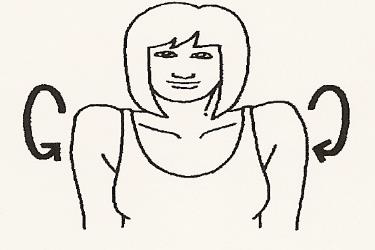 Position the chin piece directly under your chin and push the sides of the front panel around your neck. While holding the front of the collar attach the Velcro sides. Tighten neck collar enough to ensure that the back panel flexes to fit the back of your head. 5. Slide the buckles on the fabric side straps into position, onto the front panel of the brace. 1. Position yourself on the edge of the bed (see “Moving from lying to sitting up” section for technique). a. Position the chin piece directly under your chin and push the sides of the front panel around your neck. b. While holding the front of the collar center the back panel and attach the Velcro sides. c. Tighten neck collar enough to ensure that the back panel flexes to fit the back of your head. 3. 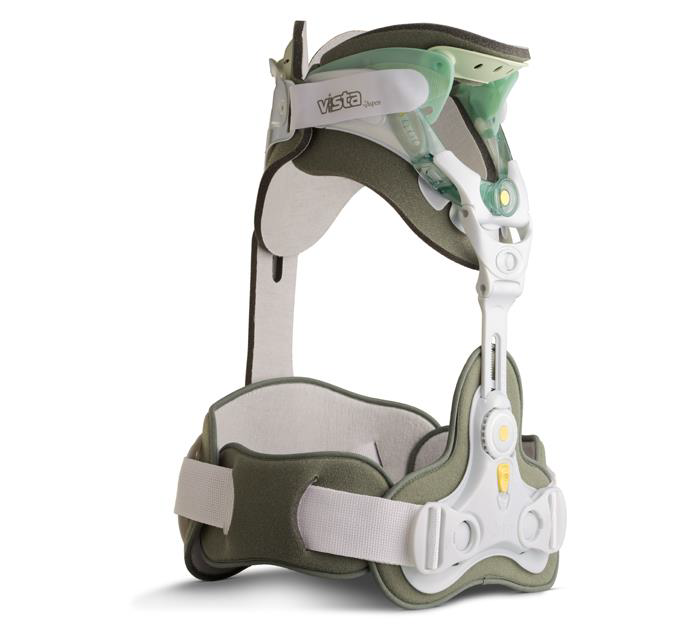 Ensure the front of the brace is positioned centrally. 4. Slide the buckles on the fabric side straps into position, onto the front panel of the brace. If you are sitting in order to apply your spinal brace please do so immediately after assuming the sitting position. If you are sitting in preparation to stand please sit for a moment before standing to ensure you do not become dizzy. To remove your brace return to the position it was applied in. Undo the straps around your waist by unfastening the buckles. Undo the velcro on the neck collar section of the brace. Place it in a position where it can be easily reached for when you need to reapply. 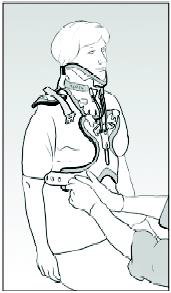 A thin layer of clothing should be worn between you and the spinal brace to prevent rubbing or sores. The spinal brace should be tight but comfortable. If excessive sweating occurs, please remove the spinal brace and rest for short periods lying down – this is especially important if you have a wound from surgery. 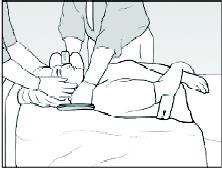 The spinal brace should be kept on at all times except when lying flat – You do not need to wear your brace in bed, unless you have been instructed otherwise by your physiotherapist or consultant. You may need to wear a collar overnight. If this is the case your physiotherapist will teach you how to apply and remove the collar. The spinal brace will only limit movement within your back, not eliminate it completely. It is important that you monitor your posture to prevent slouching, and avoid any bending, lifting or twisting. Bathing and showering is not permitted unless you are given special instruction from your consultant. If you feel you may need guidance with washing and dressing technique please discuss this with the Occupational Therapist on the ward prior to discharge. If you have any problems with the spinal brace please do not hesitate to contact the physiotherapy team on the number in the “Useful contact numbers” section. These exercises are aimed at maintaining strength in the muscles that support your back. They should be carried out approximately three times a day, gradually building up to 10 repetitions of each exercise. If you experience any increase in pain, cease from doing the exercise until the pain resolves, at which point you can recommence the exercise. Start position: Your spinal brace does not need to be worn for this exercise. Lie on the back with both legs bent and feet together. Action: Hollow your stomach and contract the abdominals to roll the tail bone off the floor. Do not push down excessively through your feet. Sustain the contraction using minimal effort for approximately 5 secs. 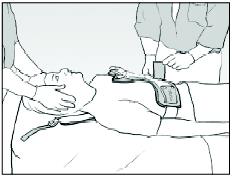 Start position: Your spinal brace does not need to be worn for this exercise. Lie on the back with both legs straight. Action: Hollow your stomach as in the previous exercise. Slowly slide one heel up towards your buttock, keeping it in contact with the floor. Slide your heel back to the starting position and repeat with the opposite leg. Throughout the exercise ensure you are maintaining a hollowed stomach. In sitting or in standing. Roll your shoulders in both directions. Lift your arm up forwards letting your thumb lead the way. You may also be provided with additional exercises to strengthen your back and legs if your physiotherapist deems this necessary. Initially after your hospital admission your back may be sore as you move; this may increase over the first couple of days but will then improve. You should aim to walk short distances little and often to ensure your muscles do not stiffen up. Once you are home try to increase the distance you walk daily always paying attention to your posture. It is important to strike a balance between periods of activity and inactivity. Inactivity can be just as harmful to your back as over activity. Whilst sitting out in a chair you should ensure a good upright posture. You should avoid standing still or sitting for prolonged periods as this will cause your back to stiffen and your posture to deteriorate. Avoid sitting in soft low chairs as this will cause your back posture to become rounded even with the support of the spinal brace. A good firm support is usually desirable; a mattress that is too soft will provide you with little support. You are free to move around in bed but you must ensure, where possible, that your position is not twisted (i.e. legs and body are aligned and pointing in the same direction). Return to work will depend very much upon the individual and the type of work you do. It is important that you ask your surgeon when it is safe to return to work. Do not lift heavy objects and avoid holding items at arms length. 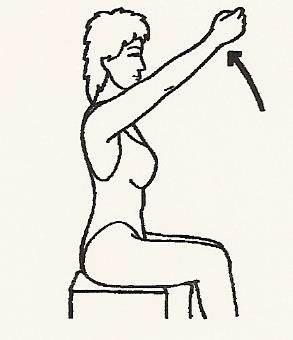 Always use a correct lifting technique, bending at the knees and not at your back (see following diagram). Avoid bending, twisting or leaning movements as these will increase the strain on your back. Before you are discharged from hospital you will need to be able to apply and remove your spinal brace without the assistance of a healthcare professional. Often patients manage by themselves straight away, sometimes family members/carers are taught how to help apply and remove the spinal brace. You will also need to be able to sit comfortably in the spinal brace, walk short distances and be able to walk up and down a flight of stairs (if you have them at home). You may be expected to attend for follow-up X-rays to monitor the healing process. If this is the case then you will be provided with dates and times for these appointments by your physiotherapist. Please attend X-ray first and then to see the physiotherapist. Please allow good time for these appointments as occasionally there can be delays. The spinal brace is usually worn for a period of 8 weeks, to support your back and prevent movement around the fracture site, but this can alter depending on your healing rate and your consultant’s opinion. After your final X-ray you will be told if your fracture has healed sufficiently for you to be able to remove the spinal brace. The physiotherapist will discuss this with you and give you further instruction at this point. You will be advised to gradually reduce from your spinal brace to prevent sudden strain on your back and also to help to strengthen your spinal muscles slowly to minimise discomfort. Your physiotherapist will advise you on this, recommending you decrease the time spent in the spinal brace daily over 1-2 weeks. You may feel stiff initially in the affected part of the spine when you start to reduce the length of time spent in the spinal brace, this is normal, and will improve as your activity levels increase. The physiotherapist will provide you with exercises to improve this, and also to build up the muscle strength in your spine. If required, you may also be referred for out-patient physiotherapy to further support your recovery. Once out of the spinal brace, you should try to maintain a good upright posture. The spinal brace will have supported you up until this point and slumping will cause additional strain on your muscles. Heavy lifting should be avoided and return to activity should be controlled. If you have any specific activities you wish to return to please discuss this with your physiotherapist for advice. 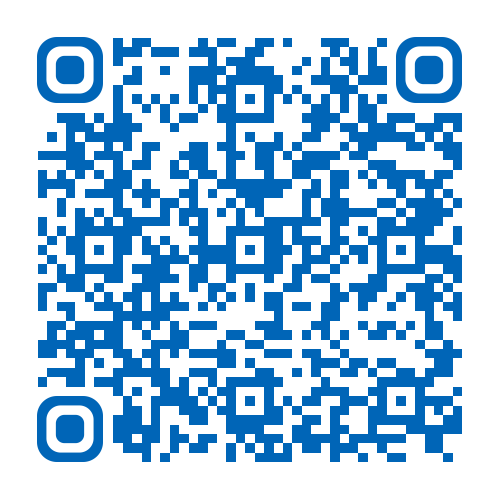 Hull Royal Infirmary Physiotherapy Department, (01482) 674539. Ward 4 – Hull Royal Infirmary, (01482) 675004. Prior to your appointment on the ward you will need to attend the X-ray department on Floor 2, HRI. Please go to the X-ray department at your stated appointment time where the X-ray will have been ordered for you. Once completed please make your way to Ward 4 located on the 4th floor and ask for your named physiotherapist. You will be assessed by the physiotherapist and your X-ray will be reviewed by the doctor. Your progress and future plan of treatment will be decided and discussed with you at each review. Please allow approx 3 hours for your appointment, as occasionally there can be delays and due to the nature of acute injuries other investigations maybe necessary.